A molecularly-imprinted polymer (MIP) was prepared by electropolymerization of pyrrole (Py) onto a stainless steel frit, using ochratoxin A (OTA) as the template, in order to make a micro solid phase preconcentration (μSPP) device. The OTA template was removed with 1% triethylamine (TEA) in methanol. Compared to non-imprinted polypyrrole (PPy), the molecularly-imprinted polypyrrole (MIPPy) enhanced the selective binding of OTA. The percentage recovery improved from 0 to 40% when the OTA sample solution was acidified with 1 M HCl (1% by volume). At a flow rate of 0.2 mL/min, maximum OTA binding was reached in 6 min after a total loading of 3.2 ng OTA. 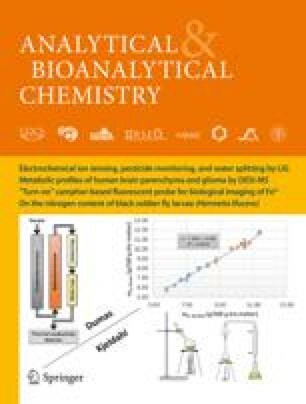 Final elution of the OTA was analyzed by high performance liquid chromatography (HPLC) with fluorescence detection, using 20:80 v/v acetonitrile–ammonia buffer (NH4Cl/NH3, 20 mM, pH 9.2) as the mobile phase. The MIPPy-μSPP-HPLC results clearly demonstrated that the MIPPy-μSPP device afforded selective preconcentration of OTA from red wine samples, at OTA concentration levels as low as 0.05 ppb, prior to HPLC analysis. Financial support of the Natural Sciences and Engineering Research Council (NSERC) Canada is gratefully acknowledged. S.K. thanks Environment Canada for funding of a Science Horizons Youth Internship Program placement.